Before he became WWE’s first–ever Undisputed Champion, Chris Jericho attempted to earn an opportunity to face Kurt Angle for the WWE Championship. Jericho’s chance came on the Oct. 30, 2000, edition of Monday Night Raw in a No. 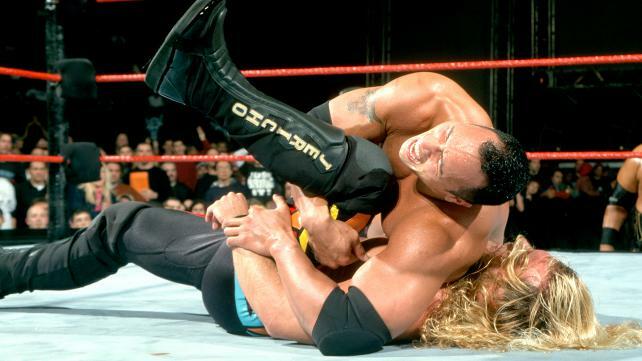 1 Contender’s Match against The Rock. The former WCW star had been with WWE for a little more than a year and certainly gave The Great One a run for his money in this contest. With the winner facing the WWE Champion on SmackDownlater in the week, the stakes were high and Jericho wasted no time going on the offensive. As they brawled in and out of the ring, neither Superstar had a clear advantage. At one point Jericho locked in the Walls of Jericho but The Brahma Bull reached the ropes, and then countered with a Sharpshooter. Ultimately, The People’s Champ caught Jericho with a Rock Bottom and earned the WWE Title opportunity.